How do you communicate with friends and family that are long distances away? Of course today you can call them on the telephone, text a message, email, even skype a video conversation with them. Other than traveling the long and time-consuming distance to meet them, the early residents of Missouri could send a letter. The United States Constitution provided for the government to maintain a postal service from the beginning of our nation, but that early postal service had a good many faults. Roads were extremely poor pathways, it at all, and the only way to transfer the mail was by wagon or horseback. It took weeks for a letter to travel from New York to San Francisco. How on earth could someone get a quick response if they needed it? The government contracted out the delivery of the mail to various overland companies. These freight and stagecoach companies were somewhat like the Greyhound buses of the late 20th century. They transported people and products from one place to another, although not very quickly. One company from Missouri, the Russell, Majors, and Waddell Company, began looking at ways to speed up the delivery of the mail. William Russell felt that the best way to do this was to separate the mail to a designated group of deliverers on a specified route strictly for mail delivery. This group would be solitary riders, carrying the mail in specially designed pouches for a certain distance. At the end of this rider’s journey the pouch would be handed off to a new rider with a fresh horse to take the mail farther down the route to the next rider. The riders would be young and small with fast horses to ride full speed down the route. Switching off to a new rider would guarantee that the delivery would remain at top speed the entire journey. Russell’s company purchased 500 horses, built 190 stations at 25-mile intervals, and hired 200 station attendants plus 80 riders weighing no more than 125 pounds. These riders were typically young, teenaged males willing to seek adventure. These logistics gave Russell confidence that the riders could get the mail to California in half the time it took the Butterfield Company, who had the government mail contract, to get there using a southern route. It usually took about ten days to carry the mail the two thousand miles to California and the record was seven days. Russell’s idea became known as the Pony Express. The journey began at St. Joseph, Missouri and ended at Sacramento, California. The route was risky, with Native Americans, animal predators, and bandits. The company liked to hire orphans because of these risks. Some legend holds that the youngest rider , Bronco Charlie Miller, was only 11 years old. 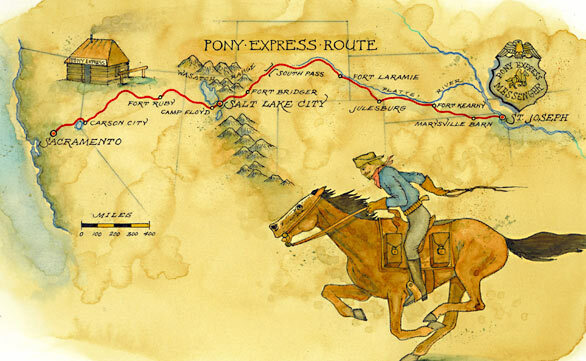 The first Pony Express rider left St. Joseph on April 3, 1860. The rider went from one station to the next, got a new horse and grabbed the mail ready to start its journey westward. They usually travelled around 75 miles a day at about 10 miles an hour. Speed was vital during these pre-Civil War days because people were concerned that poor communication with the East would cause California to go with the Confederates. The Pony Express did what Russell had hoped, getting the mail to California at a greatly reduced time than the existing contracts. Unfortunate for his company, the Butterfield Line still received the mail contract. The Russell, Major, and Waddell firm was already dealing with financial problems when they started the Pony Express. They really needed to get the contract to survive. It is a shame that Russell didn’t introduce this concept earlier. Technology was advancing at this time in the area of telegraphy. Telegraph lines would be strung along the same route that the Pony Express traveled. Crews from Missouri and California met in Salt Lake City in October of 1861, connecting the telegraph lines across the nation. Within days, the Pony Express would make its final ride. The telegraph and trains with entire cars devoted to the mail would replace this short lived idea of mail delivery.